Cathy Merrill during a "Granite Arms" club practice in Manchester, NH shows the strain while competing against Jake Lottman, 29, of White River Junction, VT.
SUNAPEE, N.H. — It began at a little country fair nine years ago when, on a whim, a friend challenged Cathy Merrill to do something she’d never done: enter the local arm-wrestling contest. 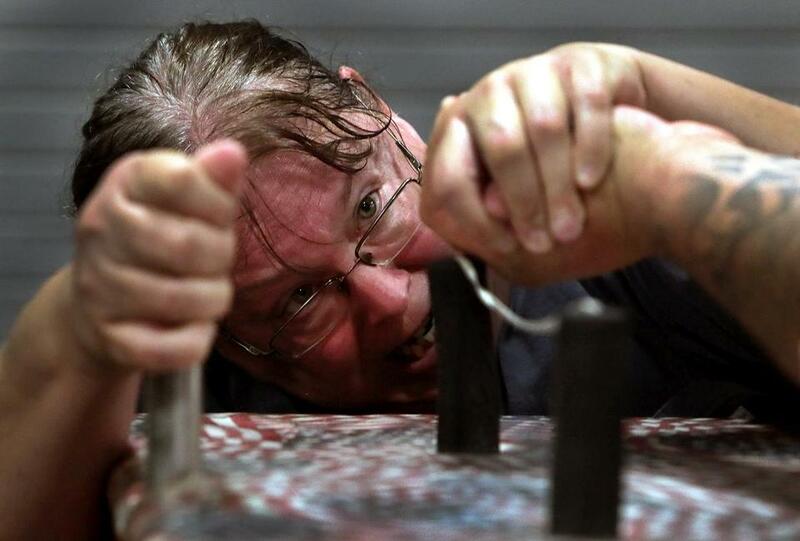 What happened that day at the Cornish Fair has led the 53-year-old New Hampshire native around the globe — from Malaysia to Bulgaria to Hungary — and to the top of the arm-wrestling world. She is 53, 6 feet tall, and weighs 340 pounds. And she is a world champion arm wrestler in her weight class — a title she will seek to renew next month in Antalya, Turkey. Cathy Merrill during a "Granite Arms" club practice in Manchester, N.H. shows the strain while competing against Jake Lottman, 29, of White River Junction, Vt. The truth is nothing much worries Cathy Merrill. She’s the mother of three, the grandmother of five. She drives a school bus for the local school district. And in this little corner of the world where she grew up and has raised her family, she is a beloved celebrity. “She drives her school bus and she’s very devoted to arm wrestling, but she doesn’t boast about it,’’ said Jim Duling, her longtime friend and the guy who bought her those Cornish Fair french fries in 2009. “She’s not Rocky Balboa. She’s just very calm and cool about it. 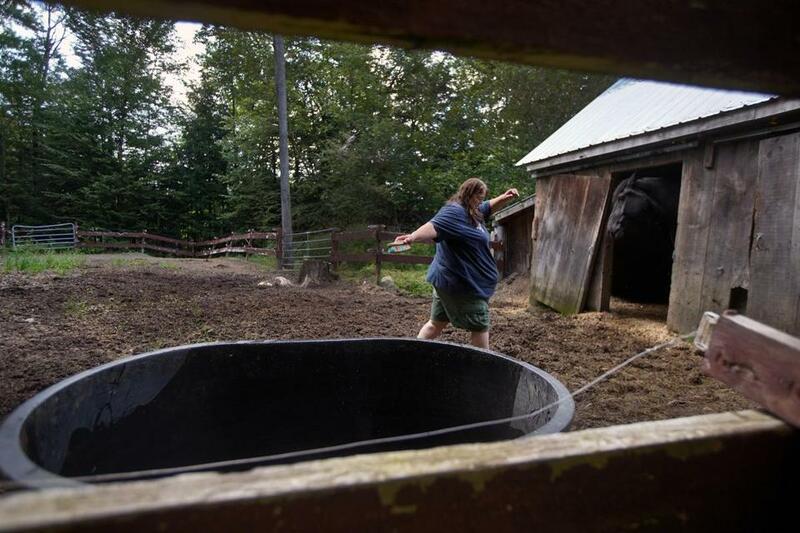 Cathy Merrill hurries to feed and water her Percheron draft horse "Big Ben" after finishing her last run of the day as a full-time bus driver for the Sunapee school district. There is a gentility about Cathy Merrill that belies the fierce competitor who has conquered her obscure corner of the sporting world. She was born in New London, N.H., where her father was a truck driver and her family life was not the gauzy stuff of black-and-white TV situation comedies. Her home was a place of abuse and divorce and alcoholism. She played basketball and softball in nearby Newport, walking 10 miles home after practice if she couldn’t hitch a ride. She worked blue-collar jobs and once owned her own landscaping company. Brian Coronis was one of Merrill’s 81 classmates in the Newport High School class of 1982. He recalls splitting large pitchers of soda at the local pizza joint with a young Cathy Merrill, the girl he once sat next to in woodworking class. Well, not Cathy. That’s for sure. Turns out there’s a lot more to arm wrestling than brute strength. There’s intricate technique to master, as well. 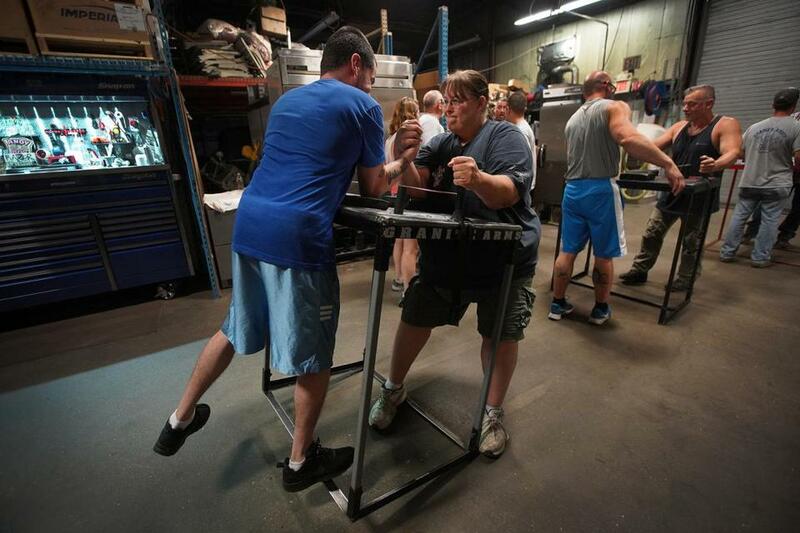 Cathy Merrill easily defeats Travis Josselyn, of Manchester, N.H., during a "Granite Arms" club practice. But Merrill has a small suitcase full of hardware, medals that she has collected at competitions across the globe. “My percentage rate is pretty good,’’ she said, a master of understatement, too. Good thing she doesn’t need the money, because there’s not much of it to be made in arm wrestling. She does her own fund-raising — benefit chicken-wing dinners at local restaurants — but remains $1,500 short of what she’ll need for her upcoming trip. She may need to take out a small loan. Along the way, collecting the medals she keeps in that little suitcase, she’s also been collecting the memories of a lifetime — special stuff for a woman who lives where she was raised. And likes it that way. Cathy Merrill with a few of her gold medals she won last year. "I keep them wrapped in socks so they don't bang together," says Merrill, who has enough medals to fill a small suitcase. She’s a world-class arm-wrestler. She’s also a gold-plated storyteller. Just ask her about that time she was competing in Bulgaria, went for a walk, found a delicious bakery. And something else. She laughs. But this is serious work. There’s a championship in Turkey to be won. And at practice in Manchester with Badger Drewes and about a dozen other wrestlers in the back of a restaurant equipment shop that Drewes owns, the talk is about the technique of arm wrestling where the nomenclature is arcane: top roll, hooks, press, power drag. Later, Merrill is at work at the 26-inch-by-36-inch arm wrestling table under the corrugated steel roof of a warehouse on a cement floor alongside steel shelving. For amateur arm wrestlers, working out next to Merrill is like working out next to David Ortiz or Larry Bird. And then Cathy Merrill approached the table, grabbed her opponent’s hand. She grimaced fleetingly. And then smiled. As usual, it was over just like that. Another victory for the reigning champ.